Unique boutiques, fantastic restaurants and diverse businesses. No Downtown Boulder experience would be complete without stepping off the bricks at 15th Street and heading east. The East End district is for creative-spirits, foodies, adventure seekers & trend-setters. Located just steps off of the Pearl Street Mall, the East End encompass seven blocks (from 15th to 21st streets) filled with delectable dining options and locally-owned shops filled with apparel, accessories and more. Check out just a sampling of all the East End has to offer below. The East End district is for creative-spirits, adventure seekers & trend-setters. This thriving Makers District features Todd Reed's incredible work space where his one-of-a-kind, hand-forged and finished jewelry made from recycled metals and sustainably-sourced raw and fancy-cut diamonds is crafted by master jewelers. John Allen Woodward's retail space also houses his workshop where fine leather, silver and gold accessories such as signature belts, buckles, wallets, shoes, boots and bags are meticulously hand crafted. Nearby neighbors include: Sherpani, who's unique and sustainable handbags, shoulder bags, travel bags and backpacks have been designed in Boulder for over a decade; Truman Boot Co. whose boots are made in a small factory in Boulder with leathers from the U.S., Italy and the U.K.; Angie Star Jewelry whose pieces are a delicate balance between romantic and organic with subtle twists to traditional jewelry design; and By Elke who specializes in one-of-a-kind or small run handmade leather & vintage canvas bags and accessories. Tantalizing your taste buds on the East End is a piece of cake to say the least! Check out Foolish Craig’s Cafe where Guy Fieri (Diners, Drive-Ins & Dives) is a fan of the warm toasted oatmeal stout bread with the BLT Guacamole. For dessert he recommends ordering the decadent 21-layer butter rum caramel crepe cake with cream cheese frosting. Just down the street is the one-and-only, Frasca Food and Wine - the creation of Master Sommelier Bobby Stuckey and Chef Lachlan Mackinnon-Patterson. If these names sound familiar, it's because Frasca is frequently recognized nationally with awards and accolades - including several nods from the James Beard Foundation. 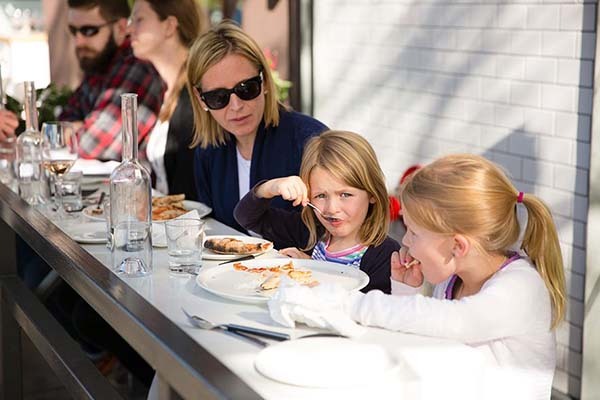 Right next door is Frasca's Pizzeria Locale serving amazingly authentic Napoletana pizza made the southern Italian way using simple, fresh ingredients and cooked to perfection in two minutes in a 900° oven! Carnivores won't be able to resist the mouthwatering vegetarian options at Leaf. The restaurant is dedicated to creating an outstanding vegetarian dining experience using seasonally produced organic, freshly-harvested produce, herbs and free range eggs. Stop by for brunch, lunch or dinner for vegetarian, vegan and gluten-free options from Jamaican Jerk Tempeh & Avocado Tartar to Jackfruit Enchiladas & Red Velvet Beet Cake. Other scrumptious options on the East End include: Mateo, Organic Sandwich Company, Dish Gourmet & Snooze, an A.M. Eatery to name a few. When your ready to indulge and give the plastics (or paper) in your wallet a little workout, there are plenty of options on the East End. Go where the locals go for timeless trends, fashion forward pieces, athletic wear and outdoor gear. Options include: Barbara & Company, Chelsea, Violette, Haven, Ramble on Pearl, Go Far, MontBell, Mountain Standard - and that's just to name a few. Looking for accessories? Stop by Two Sole Sisters to make sure your feet are in fashion. Head to Art + Soul for gold and silver pieces. Need to buy a gift? Bliss, Momentum, Jones + Co Modern Mercantile & PosterScene are just some of many great options. Feeling creative? Sew something at Fabricate; cook something at Food Lab, or paint something at Color Me Mine! Want to spend the night? The Bradley Boulder Inn is a charming bed and breakfast option. Ready to exercise? Full Cycle can get you going and if you need a little pick-me-up, check out their Tune Up Bar - a full espresso bar & tap room. Need some TLC? The Dragontree Spa, Blo Blow Dry Bar & Twig can help you relax and unwind and glam up for any occasion.